Knitting: I still love my Pi shawl. I'm knitting and knitting on it. I don't know what I will do for the border or when I will start. Quilting: I got my sewing machine back from the shop. I got to finish a Harry Potter block that I started last Sunday. It's the Monster Book of Monsters. I also jumped back into my 30s star quilt and realized after working on it for almost a year that I could chain-piece even though I'm foundation-piecing. I tried it on Friday and it's very fast. Plus it save a TON of thread. I finally went back to my Quilt-a-Long blocks. I left them languishing because I didn't know what to do for sashing or borders. I realized this weekend that I don't really care! I made the blocks for the fun of making them and I'm not at all invested in the final product. I found a fabric that goes with it that I had enough of in my stash to start slapping on some sashing. It's nearly done. Just the borders left now. Amazing how fast it goes when you finally just sit down and feed it through your machine. 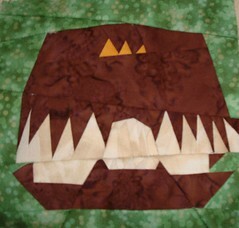 I think I will use this quilt to practice hand-quilting. I can do some by hand and some by machine. Then I think I'll donate it. I decided out of nowhere to make Peanut the elephant from Last-Minute Patchwork + Quilted Gifts . I was completely baffled by the first sewing step because, I believe, it leaves out a crucial bit of information about where to sew. Once I got over that hurdle the rest went together very quickly. I only have a tiny bit of stuffing so now it has to wait at least until tomorrow to get finished. Cheese: I was at the grocery store yesterday and noticed this in the cheese case. And so long as I was humiliating my family by photographing cheese why not take a few shots of the pretty ones with all the flowers? News: I can only guess that today was a slow news day in Seattle.